For the electorate, see Raglan (New Zealand electorate). Raglan is a small beachside town located 48 km west of Hamilton, New Zealand on State Highway 23. It is known for its surfing, and volcanic black sand beaches. Humans have inhabited the area of Raglan for at least 800 years. The Māori people named the site Whaingaroa ("the long pursuit"). The name "Raglan", adopted in 1858, honours Fitzroy Somerset, 1st Lord Raglan (1788-1855), who had commanded the British forces in the Crimean War of 1853-1856. The 1858 census put the Ngati Mahanga population of Raglan at 424. The first Europeans to settle in the area, the Rev James and Mary Wallis, Wesleyan missionaries, were embraced and welcomed by local Māori in 1835. European settlement, including large scale conversion of land to pasture, began in the mid-1850s after a large sale of land by Chief Wiremu Neera Te Awaitaia. The Raglan economy initially featured flax and timber exports, followed by farming which remains the mainstay of the area. Tourism and the arts are also significant contributors to the current economy. Raglan and District Museum contains historic artefacts and archives from the region. A new museum building was built in 2011. The town became the scene of public civil disobedience campaigns in the 1970s. During World War II (1939-1945), the New Zealand Government took local ancestral land from indigenous Māori owners to construct a military airfield. When no longer required for defence purposes, part of the land, a 62-acre (250,000 m2) block, was not returned to the owners but instead became the public Raglan golf-course. There ensued widespread protest and attempts to reoccupy the land; in 1978, 20 Māori protesters were arrested on the ninth hole of the golf course. The land was eventually returned to the owners. It became a focus for local job-training and employment programs, as well as for the Māori sovereignty movement. As the graph below shows, Raglan's population grew slowly until the main road from Hamilton was completely metalled in 1921 and then grew again after completion of tar-sealing in 1961. Raglan area unit had the census figures shown in the table below. Growth by about 500 households is expected by 2045. According to the 2013 census, there were 477 (29%, indicating the number of baches and beach houses) unoccupied dwellings and 1,173 occupied, 27.3% of the population were Māori, 11.9% spoke Māori, 20.1% were born overseas, 57.2% owned the house they lived in (lower than the national average of 64.8%), and 71.3% had Internet access. Employment and commuting increased between 2006 and 2013, as shown in this table. 23.1% held a degree, unemployment was 6.9%, the largest category of workers was 'professionals' (almost 30%) and the largest work-category 'accommodation and food services', employing 180. The population of the Raglan ward (covering most of the harbour catchment area) was 4680 in 2006. It had increased to 4920 in 2013. The two main arms of Whaingaroa Harbour, Waitetuna left and Waingaro right, divided by the Paritata Peninsula, with Karioi in the background. Raglan is associated with Whaingaroa Harbour (also known as Raglan Harbour) on the west coast of the Waikato region in New Zealand's North Island. The harbour catchment covers 525 km2 and the harbour covers 35 km2 and has 220 km of coastline. It runs 12 km inland from the entrance, for the most part is less than 2 km wide, has a high-tide area of 32.96 km2 (12.73 sq mi), a low-tide area of 9.01 km2 (3.48 sq mi), 2–4 m tidal range, with a spring-tide range of 2.8 m and neap 1.8 m, spring tide flow around 46 x 106 m3 and neap 29 x 106 m3. A 2005 survey said on average water stays in the harbour 1.1 days at spring-tides, but a 2015 study showed a median residence time for whole estuary of 39.4 days with median river flows, ranging between 18 and 45 days. 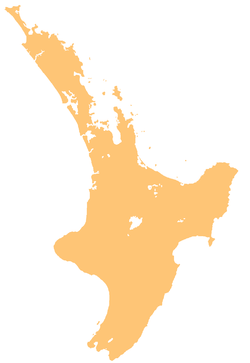 It is the northernmost of three large inlets in the Waikato coast (the others, also drowned river valleys, are Aotea Harbour and Kawhia Harbour). 15 significant rivers and streams run into the harbour, including the largest, Waingaro and Waitetuna, accounting for 60% of catchment area, and the smaller Opotoru and Tawatahi rivers. A study for Regional Council said, "Whaingaroa Harbour began to fill with sediment at least 8000 years before present (B.P.) and before the sea had reached its present level 6500 years B.P. Rapid sedimentation in the harbour before 6500 years B.P. is attributed to the formation of now relict intertidal shore platforms up to 700-m wide and ≤10 m below present-day mean high water level. These coastal landforms were rapidly formed 8000-6500 years B.P. by physical weathering of soft mudstone cliffs and wave action. Consequently, all but the upper two metres of the present day sediment column was deposited before 6000 years B.P. and thousands of years before the arrival of Maori some 700 years ago. Today, the harbour has largely infilled with catchment sediment up to ~8-m thick, with 70% of its high tide surface area being intertidal." It concluded that most sediment is now swept up to 20 km out to sea. Southwest of the township stands the extinct volcano of Mt Karioi. According to Māori legend the Karioi was a jilted Māori Princess who, upon discovering that love was lost, lay down and rests. North of the harbour mouth there are extensive dunes and dune-dammed lakes. Like the beaches, the dunes are rich in ironsand and have been considered for mining several times. Threats of seabed mining following passage of the Foreshore and Seabed Act 2004 resulted in formation of the opposition group KASM, based in Raglan (see also Mining in New Zealand#Opposition and Sand mining#New Zealand). The area is also home to the popular tourist destination, Bridal Veil Falls, which is located 20 kilometres southeast of the township and the unusual Lake Disappear 4 km further on. Average annual rainfall at Raglan 1984-2004 was 1.354m a year. Average temperature and rainfall graphs show an average high of 24C in February and an average low of 8C in July. Raglan usually has no more than a degree of frost and then only for a few hours on occasional winter mornings. Raglan is best known for its surf. Eight kilometres from the Raglan township is a series of surf breaks including Indicators, Whale Bay, Manu Bay, Vortex Bay. Manu Bay was featured in the 1966 movie The Endless Summer and in the 2010 movie Last Paradise. Whale Bay is a left hand point break that breaks up to 200m in length, from about 2 to 8 feet+. It has two sections, an inside hollow section up to about 4 feet that breaks very close to the rocks, and an outside, slower section from 4 feet up. It has been rumoured by locals to link up with the next break further down-Manu Point-but only on very large swells, making a potential ride of up to 2 km from the top of Indicators, which locals say has only been achieved once. Manu Point is a left hand point break which works from 2 to 10 feet+, breaking over 300m. It has alternate hollow and wall sections, occasional barrels, and is usually about 2/3 the size of Indicators. Vortex Bay is a soft peak east of the boat ramp that sometimes breaks on low tide when the swell is too large for the main three points. There is also a beach break further down from Manu Point. Ruapuke is another beach break well to the west around the point. Raglan has hosted a world championship surfing event at Manu Bay in 1998. Raglan is also home to New Zealand's first sanctioned surf school, the Raglan Surfing School which was established in 1999. Visual artists hold regular exhibitions at the Raglan Old School Art Centre. Fabric artists show their creations in the biennial ArtoWear competition. There is also a Raglan Arts Trail Guide with an Open Studio Weekend in late January. For Matariki there are displays of Māori art. Local art is on display in the Show Off Gallery, Kanuka Design, Matapihi Gallery, local cafes and the Raglan Old School Arts Centre. The Arts Centre is in a 19th-century heritage building, the former Raglan School. There is a regular market on the second Sunday of every month at the Raglan Old School Arts Centre in Stewart Street. This Raglan Creative Market specialises in local crafts, food and art. There's a live music scene in Raglan. The International Soundsplash Eco Reggae Festival ran yearly in summer on the Wainui Reserve, between 2001 and 2008 and more recently, and attracted some of the biggest names in roots, reggae and dub, as well as local acts. The main venue in Raglan for live music is the Yot Club, a regular stop for NZ musicians on national tours. There is also live music at the Orca Restaurant and Bar, the Harbour View Hotel, the Raglan Club and The Old School. The Musicians' Club have open-mic nights at the Orca Restaurant and Bar on the first Thursday of each month. The New Zealand reggae bands Cornerstone Roots and Zionhill were formed in Raglan. The Raglan bus carries bikes. In summer it runs here to Manu Bay. Whaingaroa has no cycle lanes, but Te Ara Kākāriki Ocean Trails opened on 3 December 2016, providing about 4 km (2.5 mi) of mountain bike trails in a pine forest on Wainui Reserve. A 43 km (27 mi) to 85 km (53 mi) bike race, mainly on gravel roads around Mt Karioi, takes place each July. About 21 km (13 mi) from Raglan, Pipiwharauroa Way has 9 km (5.6 mi) of cycle/walking track, which links to a very difficult 7 km (4.3 mi) paper road to Waitetuna. Whaingaroa has a high proportion of environmentalists, as evidenced by the existence of several high-profile environmental groups. The proportion of environmentalists in Raglan is indicated by the size of the Green Party vote, which was 28% in 2011 and rose to 30% in 2014 (266 of 867 in the Taranaki-King Country constituency vote and 40 of 152 in Hauraki-Waikato). In 2017 it dropped to 20% (433), but the Labour vote rose from 18% to 40% (872), when Labour also highlighted environmental issues. The environmentalism has been recognised in local government policy as, "passionate about the arts and protecting its environment". Recycling in Raglan is managed by a non-profit organization called Xtreme Zero Waste. Xtreme's stated goal is to create a waste management system for the Raglan/Whaingaroa community in which none of the waste is stored in landfills. The organization was founded in 2000, after Raglan's landfill closed and the town decided to find an alternative to transporting its waste elsewhere. Xtreme Waste has recycled an increasing volume and percentage of waste every year, and as of 2010, it diverts nearly three-quarters of the town's waste from reaching the landfill. It operates a recycling center, which is open to the public and offers group tours. Actor Antonio Te Maioha, who lives in Raglan, has publicly spoken about his own involvement and Raglan's leadership in recycling. He mentioned that Raglan is one of the few towns in New Zealand with recycling bins in the main street, and describes how people he knew became involved in recycling because of Xtreme Waste's programs. Raglan's water supply comes from a well and the nearby Waipatukahu (or Riki) Spring between Te Hutewai Rd and Omahina Creek, about 3 km (1.9 mi) south of Raglan, where water which has sunk into the volcanic rocks, seeps along the contact with the Tertiary beds. Water is chlorinated, pumped to a 1,335 m3 (294,000 imp gal) tank and distributed through about 42 km (26 mi) of pipes. Tanks at Bow St (1,000 m3 (220,000 imp gal)) and Cornwall Rd, (1,250 m3 (270,000 imp gal)) maintain pressure. Demand has been forecast at 3,606 m3 (793,000 imp gal) per day by 2034, based on a Waikato University population prediction assuming consumption of 260 l (57 imp gal)/person/day. However, in December 2015 use was averaging 1,510 m3 (330,000 imp gal) a day. The capacity of the spring is 4,800 m3 (1,100,000 imp gal) per day. Consent allows up to 3,100 m3 (680,000 imp gal)/day (the remainder maintains a flow in the short stream below the spring) from the spring and 500 m3 (110,000 imp gal)/day from the well. Despite using less than half the consented water, water meters are planned to be installed and operational by 2017. When last rated Raglan's water got a poor 'Ed' (unsatisfactory level of risk) rating, but work was done in 2014 to upgrade the quality. The spring was long used as a source of fresh water. In 1862 a dam was built and it was used to power an 8 ft (2.4 m) waterwheel for a flaxmill. In the early 1950s the spring was again used to power a water-wheel, this time pumping water for use on the farm. Several residents had bores drilled, but over half (1000) relied on tank water. A 2½ in. bore behind the Harbour View Hotel had 1,920 imp gal (8.7 m3)/day rising to about 8 ft (2.4 m) below the surface, though rather hard and tinged with iron. Of its 160 ft (49 m) the first 50 ft. was in clay, 4 ft. in hard blue shingle tightly packed with a minimum of sandy matrix and 106 ft in papa. The 225 ft (69 m) deep, 3 in. bore for the dairy factory, 70 ft. above sea-level in Rose St, was polluted with ammoniacal nitrogen and chlorides too were high. As early as 1927 the government was being asked for help with water and sewage. In 1938, ratepayers petitioned the council for a water supply and in 1938 DSIR reported on Waipatukahu Spring where, "Beautifully clear water rises in a pool perhaps 6 ft. across on the floor of Omahina Creek at a point some 10 ch (200 m) up from the south end of the tidal flat and a few chains above sea-level" and flow had been measured at 900,000 imp gal (4,100 m3)/day, close to the 4,800 mentioned above. In 1938 the Council said the annual cost of a loan would be £700 for an estimated total cost of £10,000. Another sewage and water scheme was considered in 1949, but still the cost of a loan was too high. Despite pollution, the Rose St bore was connected to the low areas of town and the camping ground. Council put in a new pump, but it could only pump 24,000 imp gal (110 m3)/day, so in the 1959 a bore was drilled at Warihi Park, but abandoned in 1962 due to problems with flow and gas in the water. A 1959 £100,000 estimate for Riki springs supply was still considered too expensive. Finally, in 1961 Council got a £62,000 loan to bring water from Riki Springs, for a pump to lift water up the hill to tanks (another large reservoir was added in 1981), from where it ran by gravity to the top of Bow St. In October 1963, 4 weeks of dry weather resulted in council carting water to fill empty tanks. By Christmas 1963 household tanks were being filled by long hoses connected to the half-finished mains. On 8 July 1964, the first householders were invited to apply for a supply. There were problems with Christmas peak supplies and an upgrade was installed in 1972. In 1981 an extra reservoir was built in Cornwall Rd quarry. In the late 1980s, the Community Arts Council got a mural painted on the water tower. It was restored in 2015. Strawberry Fields Music Festival, held at venues around Raglan in the 1990s and until the early 2000s (decade). Wikivoyage has a travel guide for Raglan. Whaingaroa Harbour Care which has planted more than 1.5 million native trees. ^ "New Zealander 16 September 1863". paperspast.natlib.govt.nz National Library of New Zealand. Retrieved 2017-06-14. ^ "Bulldozers Levelling Sand Dunes At Raglan, Where An Emergency Landing-ground of 60 Acres Is Under Construction". New Zealand Herald. 1941-10-28. p. 9. Retrieved 2016-04-16. ^ "RAGLAN BY THE SEA (Waikato Times, 1921-04-28)". paperspast.natlib.govt.nz. Retrieved 2017-12-30. ^ a b c d e f Raglan County Hills and Sea. Raglan County Council. 1975. ^ "2013 Census map – QuickStats about a place". www.stats.govt.nz. Retrieved 10 June 2017. ^ "Keep Raglan weird: The battle over a surf town's soul". The Spinoff. 2019-04-21. Retrieved 2019-04-22. ^ a b "2013 Census QuickStats about a place". Retrieved 2017-12-30. ^ "RESULTS OF A CENSUS OF THE COLONY OF NEW ZEALAND taken for the night of the 28th March 1886". ^ "RESULTS OF A CENSUS OF THE COLONY OF NEW ZEALAND 5th April, 1891". ^ "RESULTS OF A CENSUS OF THE COLONY OF NEW ZEALAND taken for the night of 12th April 1896". ^ "RESULTS OF A CENSUS OF THE COLONY OF NEW ZEALAND TAKEN FOR THE NIGHT OF THE 29th APRIL, 1906". ^ "CENSUS RETURNS (Waikato Times, 1917-01-23)". paperspast.natlib.govt.nz. National Library of New Zealand. Retrieved 2017-01-31. ^ "THE NEW ZEALAND OFFICIAL YEAR-BOOK, 1932". Archived from the original on 2015-01-21. ^ "THE NEW ZEALAND OFFICIAL YEAR-BOOK, 1962". Archived from the original on 2015-01-22. ^ "New Zealand Official Yearbook 1972". Archived from the original on 2015-01-23. ^ "THE NEW ZEALAND OFFICIAL YEAR-BOOK 1982". Archived from the original on 2015-01-23. ^ "2001-Census-of-population-and-dwellings". www.stats.govt.nz. Retrieved 2017-01-31. ^ "2013 Census map – QuickStats about a place". www.stats.govt.nz. Retrieved 2017-01-31. ^ a b c "Waikato Regional Council Technical Report 2016/19 - Mapping residence times in west coast estuaries of the Waikato region" (PDF). 2016. Archived from the original on 2016-09-17. ^ "Climate:Raglan". Climate Data. Retrieved 5 April 2017. ^ "About | Raglan Creative Market". Retrieved 14 August 2015. ^ "Soundsplash Festival - Raglan, NZ". Soundsplash Festival. Retrieved 2017-05-10. ^ "What's On". Raglan Old School Arts Centre. 2015-04-19. Retrieved 2017-05-10. ^ "RAGLAN. (Waikato Argus, 1903-12-05)". paperspast.natlib.govt.nz National Library of New Zealand. Retrieved 2017-05-10. ^ "RAGLAN. (Waikato Times, 1904-01-23)". paperspast.natlib.govt.nz National Library of New Zealand. Retrieved 2017-05-10. ^ "What's on in Raglan today and this week– gigs, exhibitions, sports, events". www.raglan23.co.nz. Retrieved 2017-05-10. ^ The Raglan and Kawhia Districts, New Zealand: Early History, Resources and ... - Ernest Bradbury - Google Books. Books.google.co.nz. Retrieved 2012-12-18. ^ "Trails open this Saturday". raglanmtb. 2016-12-01. Retrieved 2017-05-09. ^ "Kākāriki Trail a 'whole new playground' for mountainbike riders". Raglan Chronicle. 2016-12-08. Retrieved 2017-05-09. ^ "karioi-classic". karioi-classic. Retrieved 2017-05-09. ^ "Pipiwharauroa Walking and Biking Trail". www.raglan23.co.nz. Retrieved 2017-05-09. ^ "Apr 6: Ramblers walk to the wind farm from Vandy Rd". www.raglan23.co.nz. Retrieved 2017-05-09. ^ "Taranaki-King Country - Party Vote Details". www.electionresults.govt.nz New Zealand Electoral Commission. Retrieved 2017-11-23. ^ "Hauraki-Waikato - Party Vote Details". www.electionresults.govt.nz New Zealand Electoral Commission. Retrieved 2017-11-23. ^ "It's the environment election but the Greens are wilting". Stuff. Retrieved 2017-11-23. ^ Waikato District Council modified the 2001 community document to produce Raglan Naturally and Waikato Regional Council has referred to the Whaingaroa Catchment Management Plan saying, "a zone plan for the west coast will be developed. . . Rather than reinventing the wheel, this plan will build on the great work already undertaken in the Whaingaroa catchment". ^ "Antonio Te Maioha talks about recycling in Raglan (video)". Raglan.net.nz. Raglan tourism information. 2010-07-07. Retrieved 20 November 2010. ^ a b c d "AtoJs Online — Appendix to the Journals of the House of Representatives — 1938 Session I — H-34 DEPARTMENT OF SCIENTIFIC AND INDUSTRIAL RESEARCH (TWELFTH ANNUAL REPORT OF THE)". atojs.natlib.govt.nz. Retrieved 2016-03-13. ^ a b Raglan Community Board agenda 11 August 2015 p. 297 (31 July 2015). "Raglan Structure Plan Discussion Document 2008" (PDF). Waikato District Council. ^ "Raglan water savings down the creek". www.raglan23.co.nz. Retrieved 2016-04-10. ^ "Water meters go in around Raglan". www.raglan23.co.nz. Retrieved 2016-04-10. ^ "WINZ Compliance Status for a Community". www.drinkingwater.esr.cri.nz. Retrieved 2016-04-09. ^ "May 6: Raglan Community Board agenda". www.raglan23.co.nz. Retrieved 2016-04-10. ^ a b "Raglan County Council water scheme". Waikato Times. 27 February 1961. ^ "Raglan Health Resort". New Zealand Herald. 1927-01-04. p. 10. Retrieved 2016-03-13. ^ a b "Raglan Town Committee report". Raglan County Chronicle. 13 August 1959. ^ WATER AND SANITARY SERVICES ASSESSMENT. Waikato District Council. 2008. ^ Water and Sanitary Services Assessment. Waikato District Council. 2008. pp. 34–36. ^ "Raglan Water Tower Murals". Raglan Old School Arts Centre. Retrieved 2016-03-13. ^ "Raglan Water Tower Mural Restored". Raglan Old School Arts Centre. Retrieved 2016-04-10. ^ "Raglan Chronicle". Issuu. Retrieved 2015-12-02. ^ "WRC candidate Fred Lichtwark releases his answers to sustainability poll". www.raglan23.co.nz. Retrieved 2016-09-07.